Volunteers who wish to experience the community outreach aspect of our Medicine & Healthcare programmes can join a full time Public Health project. Whether you are on a gap year hoping to study medicine at university or you already have some medical experience, you can learn about the public healthcare system in the Philippines. 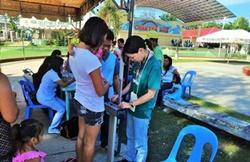 The Public Health project focuses on a healthy lifestyle programme, which aims to reduce the amount of non-communicable diseases (NCDs) in the City of Bogo and other areas located north of Cebu. According to the Department of Health in the Philippines, NCDs account for seven of the ten leading causes of death in the Philippines. NCDs, such as diabetes, heart disease, cancer and cardiovascular disease, are often the result of poor nutrition, smoking, drug and alcohol abuse; and as a volunteer on this project you can help address these issues and treat those with symptoms relating to NCDs. As a volunteer on the Public Health project, you will work alongside a local health care professional who you will assist on project based activities. One of your responsibilities will be to help conduct house-to-house surveys and screenings, such as checking the temperature, pulse rate, blood pressure and Body Mass Index (BMI) of members of families in the area you are working in. You will also test blood sugar or cholesterol levels. Based on the data collected from the tests carried out, volunteers then help to tackle any issues in the findings by informing and educating each family visited about a healthy way forward relating to treating and preventing NCDs. You will also provide them with workshops and distribute affordable eating plans to various health units in Bogo. Volunteers usually work from 8am to 5pm, from Monday to Friday, and have the weekends free to relax or travel. Volunteers live with a local Filipino host family, who will welcome you into their home and introduce you to the Filipino culture. This project is available throughout the year. Volunteers can choose to work on this project for a minimum of 2 weeks. However, volunteers who stay longer than two weeks are able to see great results. This project has been selected by our local colleagues as being suitable for short term volunteering for both the host communities and the volunteer. Although you will gain a valuable cultural insight and work intensely within the local community, please be aware that you may not be able to make the same impact as someone volunteering for a longer period. Вы можете ознакомиться с детальной информацией о целях данного проекта здесь: Philippines Medicine & Healthcare Management Plan.